Come learn about EWGSI on February 5th. Is your understanding of (and excitement about) our new EWGS website as little as the above picture?? If so, do come to our regular monthly meeting on Saturday, February 5th, 12:30, downtown Spokane Public Library where and when Cecily Cone Kelly will demonstrate and teach us about our spanking-new website, www.ewgsi.org . And Cecily will introduce us to our new EWGS Digital Digest, a prominent part of our new website. Come for the Cookies, Coffee & Conversation at 12:30; the meeting begins at 1:00. Oh, and if you want to learn more, come down at 10:00 for Shirley Penna-Oakes regular beginners' class (main floor auditorium). Today on public radio I learned that today, January 27, was the birthday of Wolfgang Amadeus Mozart, who was born in Salzburg, Austria, in 1756. He married Constanze Weber on August 4, 1782. The couple had six children but only two lived into adulthood and those two had no children. Thus, Mozart's genealogy ended. 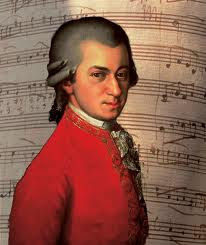 If you want to see Mozart's ancestry, click to www.mozartproject.org/biography/tree.html and have a look. For a complete biography of the man and his music Wikipedia will tell you all about him. Why this particular post on a genealogy blog? Well, it is his birthday today. And he did have ancestors (and I'm sure nieces and nephews as pseudo-descendants). And I'm guessing that most of us enjoy at least some of his music. And I loved the movie Amadeus. Genealogy can be learned in a wide variety of ways and places. Wouldn't you agree? Wanting today to show you that the past issues of our Bulletin are still viable, vital and certainly interesting. In the March 2008 issue I had an article about our area's earthquake zone and how on June 25, 2001, at 7:15 in the morning, a 3.7 magnitude earthquake rumbled through Spokane. And over that next week, and in the weeks to follow, a swarm (term used by seismologists to describe a bunch of smallish earthquakes that are close in magnitude) of 101 earthquakes occurred in Eastern Washington. 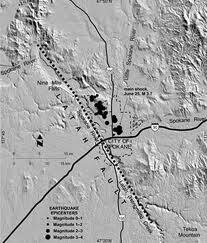 That big one, on June 25th, was centered under Gonzaga University. Were you living in town then? Did you realize what had happened? If you want to know more about that quake and any other in the area, Google Washington Geology, Vol. 29, Nos 1-2, September 2001. Very interesting read. In fact, the image used in this post (which I found in Google images) came from that book. The Northwest Room Blog posted an article on the pictures that they have posted on the internet and plans to add many more. I am working on an upcoming project where I needed some early pictures of Trent/Front Avenue in downtown Spokane and I found a couple there that really show what I was looking for. Note: Trent in downtown Spokane is now named Spokane Falls Boulevard, but it was still Trent when the pictures I was looking for were taken. They have posted pictures of Spokane Streets, Spokane Homes, Spokane Parks, Spokane Bridges, the Spokane Fire, Spokane River and Spokane Views. News flash! Got some preliminary words today regarding the Bing Crosby Family History event planned for Saturday, March 5th, 2011. EWGS will cancel our regular meeting (REPEAT: OUR REGULAR MEETING AT THE DOWNTOWN SPL IS CANCELLED) so that all members can take advantage of this free event over on the Gonzaga campus. Planned are display tables, informational tables, computer lab demos and a program about Crosby's ancestry. More details will follow; for now, mark the change on your calendar and plan to come to something really interesting, productive and sure to be fun! Update: You can register for this FREE event at http://www.heritagecenter.wa.gov/. January 5, 2011 – Student genealogists interested in attending the 2011 Southern California Genealogical Society Jamboree are invited to apply for the 2011 Suzanne Winsor Freeman Memorial Student Genealogy Grant established by friends and family to honor Suzanne’s Freeman’s lifetime of service to young people and to assist young genealogists seeking to advance their genealogical education. Suzanne Freeman was the mother of blogger and writer Denise Levenick, The Family Curator, and a lifelong volunteer who worked with many youth organizations in the capacity of leader, organizer, and administrator. She also developed a strong interest in family history, and enjoyed the growing number of young student genealogists. 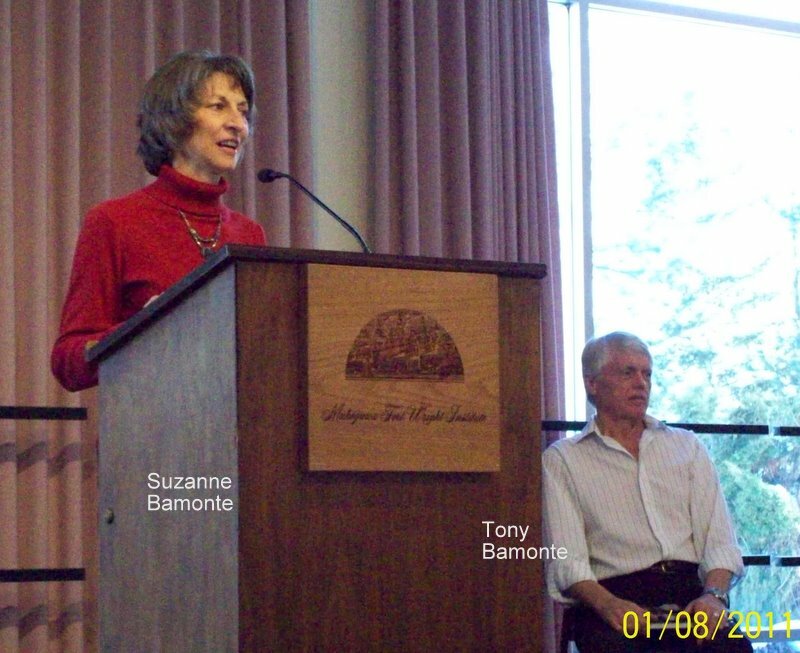 At the time of her death in Tucson, Arizona August 28, 2010, Suzanne was still searching for her elusive Winsor cousins. Genealogy bloggers came to know Suzanne the past two years at the SCGS Jamboree where she enthusiastically joined the GeneaBlogger Welcome Bag project, assisting in the assembly and distribution of gifts to attending genealogy bloggers. To honor her support of the SCGS Jamboree, the first Suzanne Winsor Freeman Memorial Student Genealogy Grant will be awarded to a student attending the 2011 Jamboree. The grant includes a check for $500 toward conference expenses. Applicants need not be a currently registered student, but must have been a enrolled at a college, university, or secondary school within the last twelve months, and be between the ages of eighteen and twenty-five. Complete guidelines and application are available online at The Family Curator blog http://www.thefamilycurator.com/suzanne-freeman-grant. Deadline for applications is February 15, 2011; the award recipient will be announced March 1, 2011. Suzanne Winsor Freeman was born January 5, 1933 in Olathe, Kansas to Arline (Kinsel) and Frank Ammi Brown, and grew up in Orange and Santa Ana after her family moved to California in 1937. She purchased property in Green Valley, Arizona in 1982 and became a full-time Arizona resident in 1997. The Suzanne Winsor Freeman Memorial Student Genealogy Fund honors her love of service and of family history. 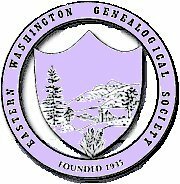 The purpose of the fund is to assist young genealogists by offering grants to advance their genealogical education, including funds to attend genealogy conferences and workshops. Suzanne enjoyed researching family history online and frequently posted queries that resulted in new family connections. She supplied stories and anecdotes for TheFamilyCurator.com, the blog written by her daughter Denise Levenick, and also appeared as a guest blogger at ShadesoftheDeparted.com. Donations to the Suzanne Winsor Freeman Memorial Student Genealogy Fund may be made at any Wells Fargo Bank c/o Wells Fargo Bank, Green Valley, Arizona 520/625-1222. For More Information Contact: Denise Levenick, dmlevenick@gmail.com, 626/688-8974. January 15, 2011 – Springfield, IL. The Illinois State Genealogical Society (ISGS) announces the debut of its newly redesigned website available to the public on Saturday, January 15, 2011. Located at http://www.ilgensoc.org, the new ISGS website features links to ISGS projects as well as links to other records and resources throughout Illinois including those individual genealogical home pages with an Illinois connection! One of the new features of the ISGS website is a members-only section which will be populated with access to Illinois-related databases for those researchers with Prairie State ancestors. Over the course of the next few months, additional members-only databases will be added. Stop By and Visit ISGS! ISGS encourages everyone – ISGS members and the public – to stop by and explore. In addition, visitors are encouraged to leave their feedback with the ISGS webmaster at isgswebmaster@ilgensoc.org. The ISGS genealogical collection is located in the Abraham Lincoln Presidential Library in Springfield and an administrative office is maintained in the Illinois State Archives. For more information visit http://www.ilgensoc.org. EWGS: Are You Out There? Hello and Good Morning, EWGS. Would like to know how many of you are reading this? And reading it regularly?? This post appeared Sunday, January 16th. When did you see it? Would you let me know????? Reply to me or as a comment. If you are a Legacy Family Tree genealogy software user, or are simply curious about this genealogy software program, you may be interested in the Legacy Users Group (LUG), which will meet next Wednesday, January 19th, from 1:30 to 3:30 PM in the meeting room of the Shadle Park Branch of the Spokane Public Library at 2111 W. Wellesley. This meeting is free and open to the public. Regular attendees will take turns in the role of moderator for each meeting. If you have more questions, please contact Donna Potter Phillips here. 4 January 2011 – The National Genealogical Society’s latest video for members, Empathy and the Analytical Process, is a short conversation with National Genealogical Society Quarterly co-editor Tom Jones. In this three minute film Tom reflects on the role of empathy in the analytical process, how it transports him from the 21st century into the lives of his ancestors and leads to solving genealogical problems. Produced by Kate Geis and Allen Moore. To view the film, log in to http://www.ngsgenealogy.org, click on the Members Only tab, and then click on NGS Videos in the sidebar menu. NGS wishes you a successful new research year! Today the Society of Genealogists in London and leading family history website findmypast.co.uk have published online over 9 million records from the Society’s unrivalled collection at findmypast.co.uk. Today searchable indexes and transcripts have been added to the website, and customers will be able to order copies of the originals for some of the records from the Society of Genealogists. In the coming weeks further records will be added to the website including Bank of England Wills Extracts containing 60,500 names, including images, and Apprentices of Great Britain containing 350,000 names. Findmypast.co.uk has been working in partnership with the Society of Genealogists for a number of years to make the Society’s collection available to a wider, international audience. Earlier projects were Civil Service Evidence of Age and Great Western Railway Shareholder records. Anyone with a full subscription to findmypast.co.uk will be able to access all the records within their existing package. Otherwise they can be viewed with PayAsYouGo credits. Members of the Society of Genealogists will be able to view the records for free via their existing membership login to the Society of Genealogist’s own website at www.sog.org.uk . The records will be added gradually during 2011. 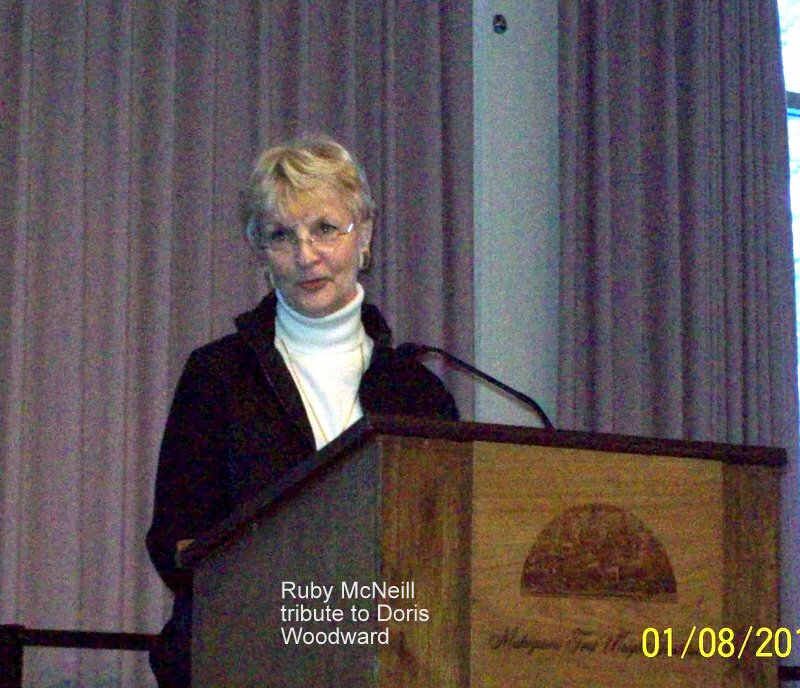 RootsTech News: RootsTech 2011 Early Bird Registration Ends January 15, 2011! 5 January 2011 - Los Angeles, CA. Elyse Doerflinger - author of the popular e-book Conquering The Paper Monster Once and For All - has released a video recording of the Conquering The Paper Monster Lecture. Elyse has presented this lecture at various genealogy societies and has finally recorded it for all the world to see! This video lecture includes the presentation slides synced with Elyse’s voice audio to create a lecture that can be listened to in the comfort of your home. Along with the video, customers will receive a .pdf copy of the handout. Conquering The Paper Monster Video Lecture is available here for the price of $7.99. In Conquering The Paper Monster Video Lecture, you’ll learn how to create a custom organizational system that is unique to your needs, wants, and personality. This lecture will walk you through the easy step-by-step process of organizing your genealogy papers. Organization is something nearly every researcher needs help with - and this lecture is perfect to help you finally “conquer the paper monster”. Elyse Doerflinger is a rising young genealogist with a speciality in organization and technology. She is the author of Elyse's Genealogy Blog, where she shares her knowledge and family history. Her love of sharing knowledge with others has inspired her to write for lecture for various genealogy societies and write for genealogy magazines. Connect with her through email, Facebook, or Twitter! Discover the rich heritage of London with NEHGS in February 2011. This unique long weekend will feature memorable events led by renowned scholars George Redmonds and John Titford, including talks, a guided tour of historic London churches, a visit to the College of Arms, optional side visits, special guests, and dinner at an exclusive private club. The weekend also includes up to three full days at Who Do You Think You Are? LIVE! — the largest family history event in the world. Space is extremely limited. In addition to events, the NEHGS English Heritage Long Weekend includes six nights lodging at the Hilton London Kensington Hotel, located at 179–199 Holland Park Avenue, London, daily coach service, and daily English breakfast for five days, and two additional group meals. Participants are responsible for their own travel arrangements to and from the Hilton London Kensington Hotel and optional activities and all other meals not included in scheduled tour events. Refer to AmericanAncestors.org for more information about the trip and accommodations. Research in the repositories of the nation’s capital with NEHGS as we return to Washington, D.C. Researchers will visit the Daughters of the American Revolution (DAR) Library, Library of Congress (LOC), and the National Archives and Records Administration (NARA) during this intensive week of guided research, individual consultations, lectures, and group meal events. Featured consultants include Henry B. Hoff, David A. Lambert, and Rhonda R. McClure. Refer to AmericanAncestors.org for more information about the trip and accommodations. Join NEHGS for our inaugural visit to Fort Wayne, Indiana, as we explore one of the world's largest genealogical collections at the Allen County Public Library (ACPL). Fort Wayne has been dubbed the “Best Read City” by Places Rated Almanac as ACPL holds more than 350,000 printed volumes and more than 513,000 items of microfilm and microfiche. Consequently, ACPL is a destination for every genealogist. The tour includes individual consultations, group meals, lectures, and other events. Please refer to our website, AmericanAncestors.org, for more information about the trip and accommodations. Searching for ancestors from New York State? Join NEHGS as we explore the vast resources of the New York State Archives. The weekend includes individual consultations, lectures, and a group dinner. Featured consultants include Henry B. Hoff, editor of the Register, and Christopher C. Child, Genealogist of the Newbury Street Press. Please refer to AmericanAncestors.org for more information about the trip and accommodations. The January luncheon is usually a fun meeting where the EWGS past presidents and the distinguished service members are honored, but they skipped that part this year since both groups were honored last June and will be again this June. The speakers were Tony and Suzanne Bamonte talking on their book Life behind the Badge: The Spokane Police Department's Founding Years, 1881-1903. 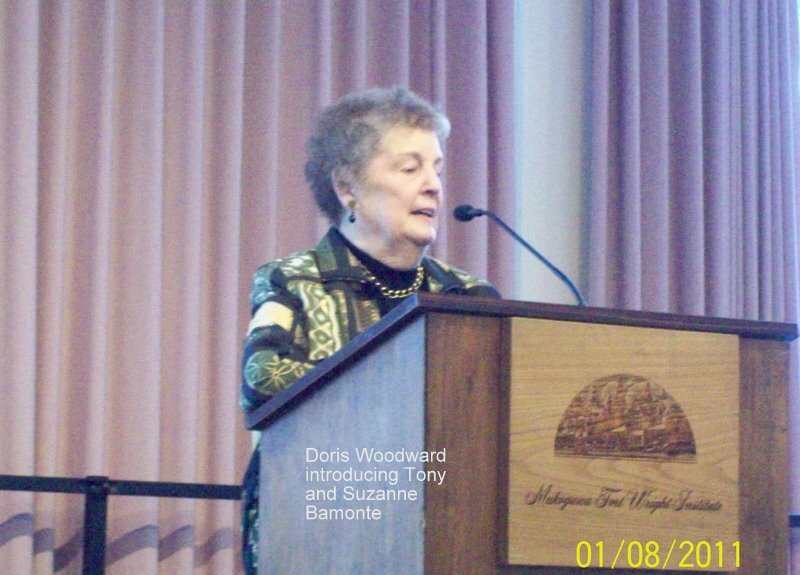 This first picture is Doris Woodward intoducing her friends Tony and Suzanne Bamonte. This is Suzanne Bamonte talking with Tony waiting to talk. 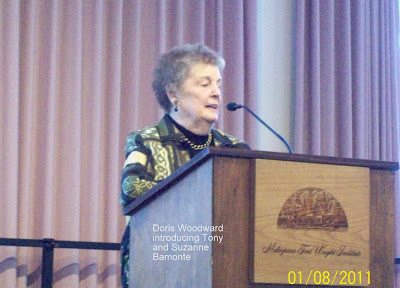 They did a great talk on the book on the founding of the Spokane Police Department, but then they went into a tribute to Doris Woodward and all the work she has done on several books the Bamonte's have published. They even showed her list of FIVE books she has written. 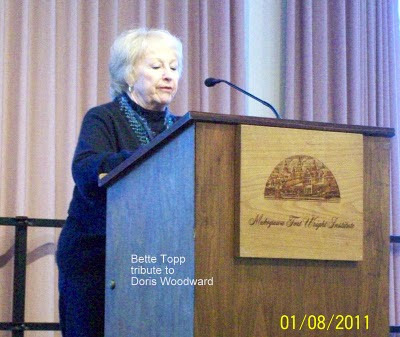 This is Bette Topp giving her tribute to Doris Woodward. 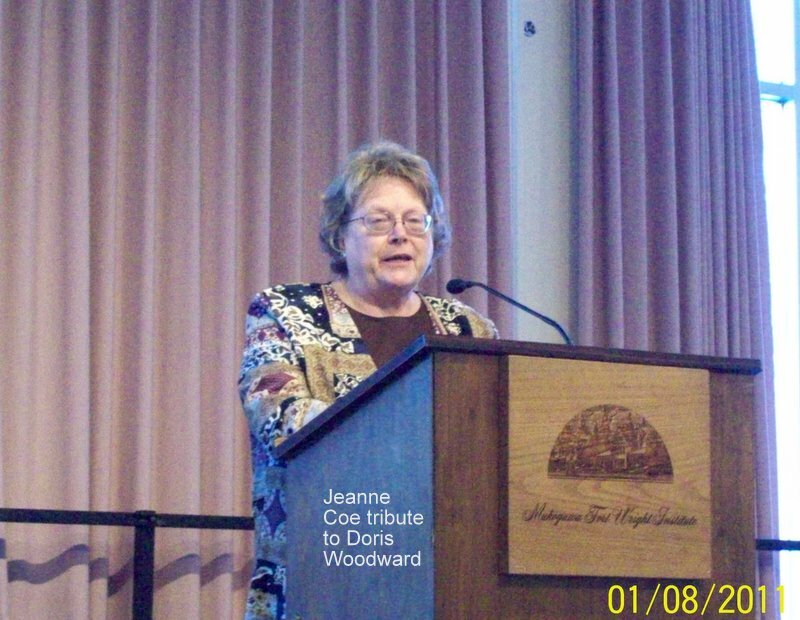 This is Jeanne Coe and her tribute to Doris Woodward. This is Ruby McNeill giving her tribute to Doris Woodward. Note my camera jammed when Dottie Braithwait was giving her tribute, and I got it working just in time for Ruby so did not get a picture of Dottie. This is the gift for Doris Woodward: a large coffee cup that says Maine on the side. Note Doris' family is in Maine and her ancestors there were some of the very first to settle in Maine. Donna Philips is explaining the gift. This is Doris thanking everyone for all the tributes. 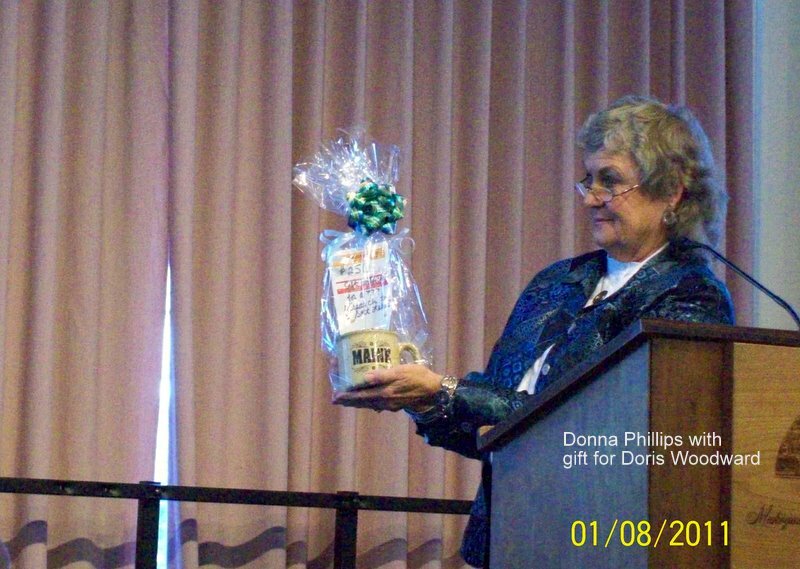 Hard to believe we will not have Doris for our Bulletin editor anymore; for the last 23 years she has made the EWGS Bulletin into an award-winning genealogical society newsletter. She was always asking for articles from me and with her expert editing my poor grammar turned into wonderful articles. 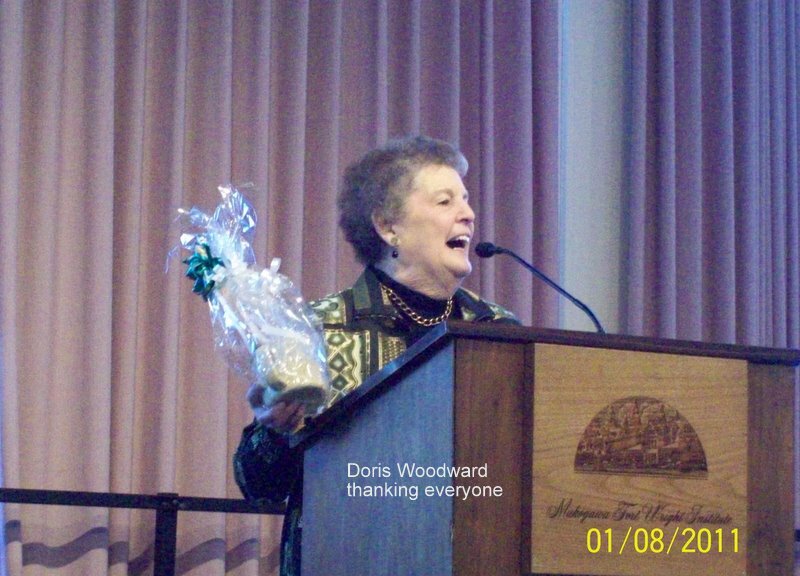 Thanks, Doris, we will miss you and the paper Bulletin as we join the digital era with an online bulletin in 2011. A few years ago I got a letter from the Family History Library asking for help in updating the Washington State Resource Guide they had in paper form. I asked for volunteers to help me and Doris Woodward was the only one that volunteered, so together we added many Washington Resources to the Washington State Resource Guide and explained some resources better than they had. Soon after we submitted our letter, they put the resource guides online and today they are in the Family Search Wiki. The National Genealogical Society announces the Call for Papers for the 2012 Family History Conference, “The Ohio River: Gateway to the Western Frontier,” to be held 9–2 May 2012 in Cincinnati, Ohio. The deadline for submitting proposals is 1 April 2011. $ résumé of recent lectures the speaker has given (those who have not spoken previously at a regional or national conference are encouraged to submit an audio or video tape of a recent lecture). Individuals may submit up to eight (8) proposals. NGS members will be given first consideration. Speakers will receive a complimentary conference registration with CD syllabus. Honorarium, travel allowance, hotel accommodations, and per diem compensation are based on the number of lectures given. 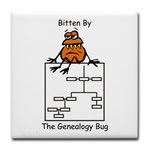 See the NGS website, http://www.ngsgenealogy.org/cs/call_for papers, for more details. faster and with greater accuracy than we have in the past.